Victoria Wilcox was born in California to a pioneer Hollywood film industry family and grew up loving dramatic stories of all kinds, especially those with a sense of history. As a young woman she developed a passion for the stories of royal families found in English historical fiction, and felt certain she was descended from King Arthur himself and destined to discover the historic Camelot. So she began her college career as a Medieval English History major – admittedly a narrow field in American academia – before receiving a degree in English Literature and doing graduate work in Playwriting. In her professional life she has been a teacher of English and composition on the college level and worked as a technical writer and instructional designer for industry and universities. A move to Atlanta, Georgia inspired a love of all things Southern and introduced Wilcox to a project that would fill the next few years of her life: the white-columned Greek Revival home built by the uncle of the legendary Doc Holliday in the last days before the Civil War. Although the Holliday House was one of Georgia’s only remaining unrestored antebellum homes it was slated to be torn down and replaced by a parking lot, so she founded a non-profit organization to save it and turn it into a museum site. 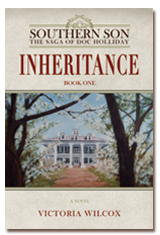 It was while researching the history of the house and its former owners that she discovered the untold story that led to Southern Son: The Saga of Doc Holliday and made her a national expert on Doc Holliday. In 2014 Wilcox was honored as the 50th annual Georgia Author of the Year for Best First Novel by the Georgia Writers Association for Inheritance, the first book in the Southern Son trilogy. She is a member of the Western Writers of America, with her writing on the history of the Old South and the Wild West featured in such publications as TrueWest Magazizne, North Georgia Journal, and the Atlanta Journal-Constitution. As Founding Director of the Holliday-Dorsey-Fife House Museum she has lectured extensively and been a guest on various television programs. 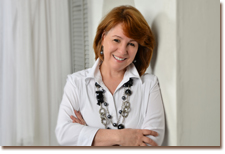 Drawing on her lifelong love of music and theater, she has written songs for Nashville recording artists and authored the musical Goin' to Zion! along with numerous smaller theatrical works. To celebrate the release of Inheritance she began a national speaking tour in the fall of 2012 with a return to Tombstone, Arizona, site of Doc Holliday's legendary gunfight at the OK Corral. 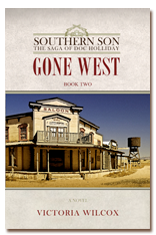 Gone West, book two of the saga, was released in May 2014 and The Last Decision will be released in 2015. 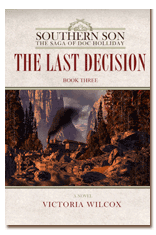 The Old South meets the Wild West in a trilogy of historical novels about the life of the legendary Doc Holliday. Born in the last days of the Civil War with family ties to the author of Gone With the Wind, his story sweeps from the cotton plantations of Georgia to the cattle country and silver boomtowns of the American West. It’s an epic tale of heroes and villains, dreams lost and found, families broken and reconciled, of sin and recompense and the redeeming power of love. Click on the books below to explore the world of Doc Holliday, watch a trailer, or read sample chapters.